I really like this blanket, just don't let your cat sleep on it. It is a loose weave and my cat has pulled up a lot of threads by accidentally getting his claws hooked. Still useable but doesn't look as nice. Indulge in the uniquely cozy feel and lightweight warmth of the charming Coast blanket by Tommy Bahama. 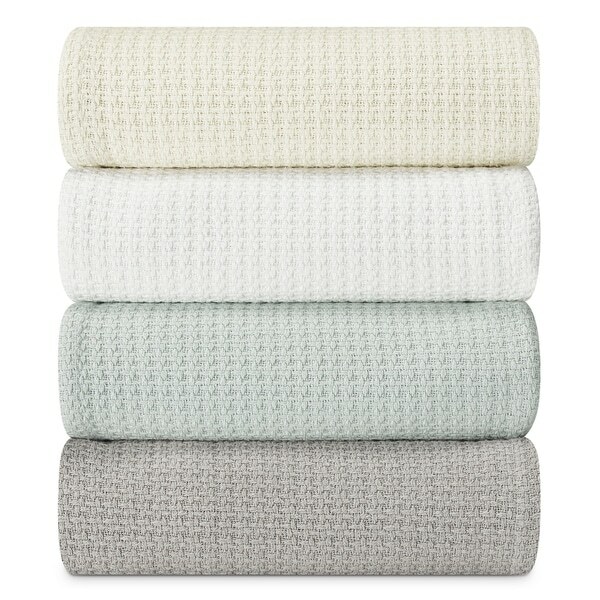 Made of premium woven cotton, this excellent blanket incorporates a stylish weave and comes in three neutral color options that sew versatile character and refreshing texture into any space. The quality of this blanket is very apparent. Upon washing it didn't loose its shape nor did it pill or shed. It feels very solid. I purchased two Hotel Luxury Super Soft Cotton Blankets at the same time that were about *** cheaper and they were no where near as nice. 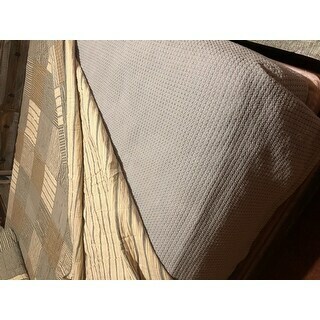 I recommend this Tommy Bahama Coast Cotton Blanket! The blanket is absolutely the best. I was afraid it might be thin, however it is a good tight woven blanket. If you like a little weight to your blanket this one will be perfect. It goes well with my lighter coverlet. It has washed up really well also. I will say the queen just hangs over each side. If you want it to really go down the side of the bed, size up. I get annoyed by negative reviews as most people are inclined to write a negative review than a positive one. Here is my review, simply stated. The blanket is made in India, 100% cotton. Perfect weight for summer/Florida. No odd smell, I wash all linens/clothing before wearing & using - doesn't everyone? Yes, lots of lint in the dryer. Best to empty the dryer lint tray a couple times during drying cycle. I purchased a king size for my king bed and the size after washing is 92" x 100". It hangs over the sides of my mattress about 13 1/2" on each side. That works for us. It's soft and a beautiful weave. We have two cats with claws. Less than 24 hours on the bed and I see a few snags as they also play with toys up there. Oh well, any fabric will snag and I will cut and tie ends as needed or live with it. Because of the pattern it's not terrible. This blanket was such an amazing deal I purchased two more for our guest rooms. Awesome purchase. Love my new Tommy Bahama Coast Cotton Blanket! This is a high-quality blanket. I machine-washed and machine-dried the blanket first thing and it did not shrink or become misshapen. It is light enough for a summer blanket, which is what I wanted, but could also be layered with others for warmeth. It's soft and beautiful and a perfect weight. I was very happy with this Tommy Bahama cotton blanket. I purchased this to replace an old blanket I had which was snagged because of the weave being too loose. The weave on this blanket is tight just as I had hoped. The double/queen size blanket will not fit even a standard queen size bed, let alone one that has a deep mattress. The stated size is 90x90 inches, but after one trip through the washer and dryer at moderate temps, it is now 81x81. I did not measure it before washing, but it is now 10% smaller than the stated size! On the plus side, the blanket seems well made of quality cotton fabric, and is a good weight for the warm season. I ordered this blanket to go with a new bedding set. The picture on the website doesn’t do it justice! I was happily surprised by the wonderful textured pattern that is woven into it. It is a nice weight and feels like it will last a long time. For people with allergies, I highly recommend that you wash it before you use it because I did and was surprised how much lint came out in the dryer. A great quality product! This blanket is perfect to use as a light comforter. Love the texture look and the colors are great and neutral. Looks very high quality for the price. Excellent quality. Nice soft cotton. My only dislike is that it only drapes over the side of my king bed about 6 inches. Order a king. Color was true to screen and as described. The blanket ripped open along the seam after the first wash, which means I didn't even get to use it one time before it became defective. It's definitely not worth the price. Since I washed it, I didn't return it. I would not recommend this blanket. The weave pulls easily. I spent the first week pulling the snags through. I've given up. Also, a lot of shrinkage when I washed it -- about 5" in each direction. It's functional but unattractive now, too small on my queen bed and snags all over! Light weight for summer but still warm. Elegant addition purchases in gray as the "blue" was an iffy color to me. Looks great with the Tommy Bahama bedspread! My husband loves it. Washes well also, well made. 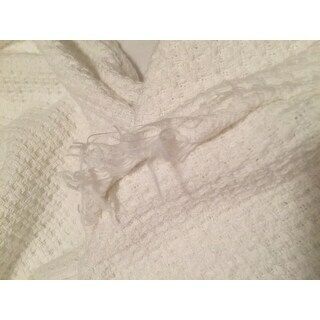 I like the material and weight of this blanket, but it started unravelling and pilling right after I put it on the bed. I wouldn't buy another one and was disappointed in the quality of this Tommy Bahama item. It is lightweight & a good all year around blanket. Price was reasonable. The blanket is not very soft but over the years has gotten softer. It is thick and seems made well. Softest most comfy blanket!! I use it as a bed spread and sleep without a top sheet. Absolutely love that it’s so light and breathable! Perfect for Florida. Love it! Its soft and the perfect layer to add to my bed. It is absolutely great when I get too hot and want to throw off the down comforter and just use this blanket plus my top sheet. I sleep so good. I will definitely buy again once it's time for a new one. "The "blue" looks green. Is it really blue?" The blanket is an aqua blue. "Is there pillow shams to match it?" No, there are no matching pillow shams for this. "what is the weight of king size?" needed lite weight blanket for the summer. thought this looked like a perfect fit for our needs. liked the colors offered. Looked like a great value"